My last post about the tools at Skokloster had a lot of pictures of very nice tools and the unfinished hall in the Castle. Skokloster has a lot to offer if you are interested in 17th century. Fine furniture, paintings, glass, roof construction or weapons, just name it, and you will find it at Skokloster. That is almost true ;-). 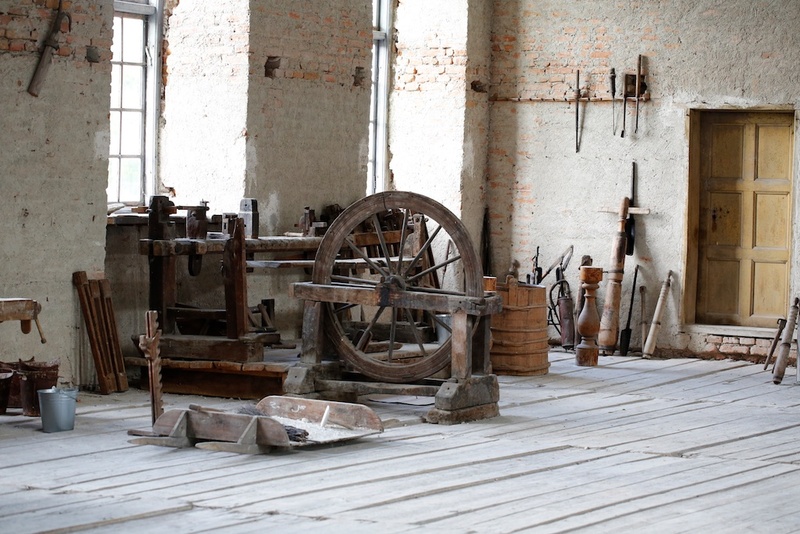 I would just like to show some of the lathes and lathe tools at the castle. The first owner, Carl Gustaf Wrangel (1613-1676) where not only rich and powerful, but also a passionate woodworker and had his lathe workshop in his castle. 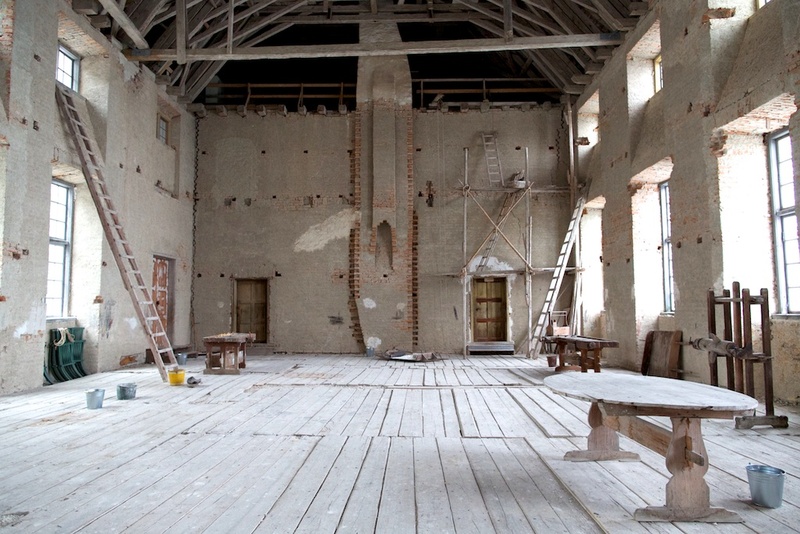 The workshop have later been moved several times and are now arranged in a room in one of the towers, close to the unfinished hall in the castle. Also several of the later owners where woodworkers and supplemented the already large collection of woodworking tools. 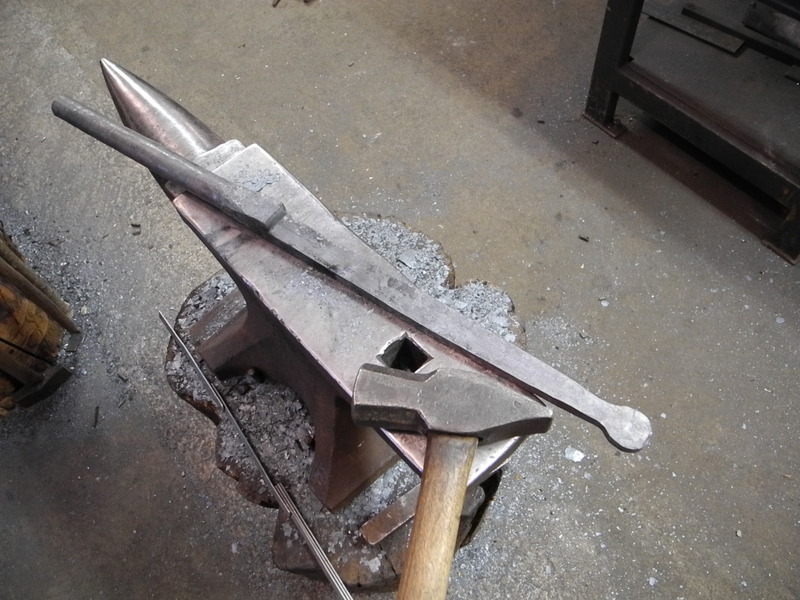 The tools have been maintained in working condition through the centuries. The Castle are now a museum that are open in the summer, and all year round for group bookings. You can also get a guided tour in English. Woodworking where common among the upper class men in Europe in the 17th century and both the tools ordered from Jan Arendtz in 1664 and the lathes and tools at Skokloster are a part of this. 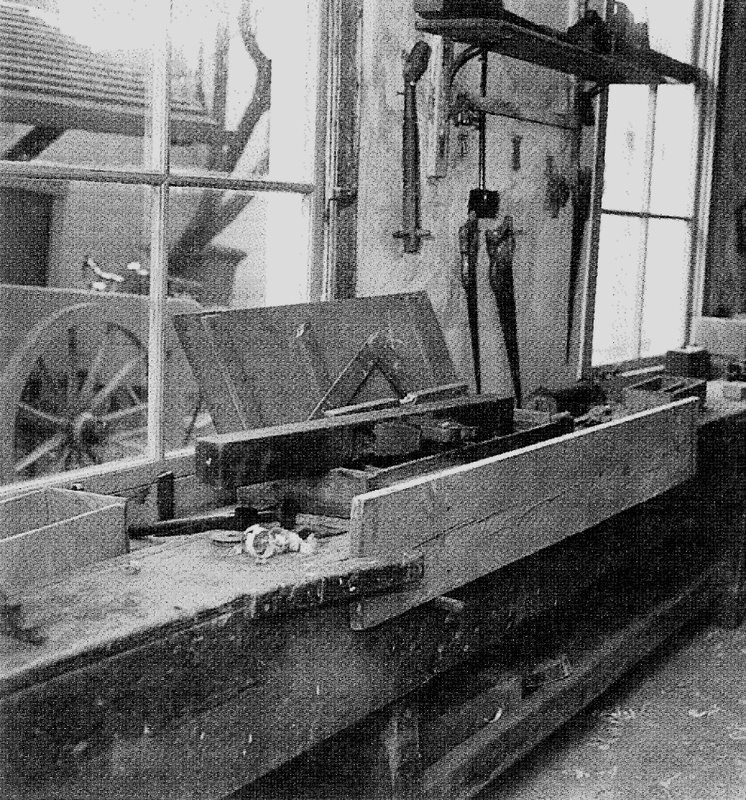 The oldest lathe in the lathe workshop are made around 1670-1675 by Johan Kesmaker and might have been used by Carl Gustaf Wrangel. The lathe tools are from different makers but a large group are made by Johan Kesmaker together with a late in 1673. (Knutsson, Kylsberg 1985) The workbenches and some of the other tools at Skokloster might have been used by the craftsmen working at the castle. I have not found a workbench that I believe to be as old as the tools made by Jan Arendtz. It is still possible that some parts of the workbench that Tomas have posted about can be a lot older than the workbench as it is today? It could be as old as the tools from 1664 and have been used by Wrangel, but we can not find a way to date this bench. Bengt Kylsberg, ed. (1997). Skokloster – Reflections of a Great Era. Skoklosters slott. It has been a while since our last post in English here on our blog. We have got a category for English language posts that could make it more easy to read for English speaking readers. I have also made a small introduction for this blog in English. When we started this blog we where expecting only readers from our Nordic countries. Most of our readers so far, are from English speaking countries, but we have had readers from 92 countries around the world. How all theese can get something out of our Norwegian or Swedish texts, are a mystery? I enjoy reading the blogs that you readers are wrinting. There is a lot of interesting and useful stuff about workbenches. Some of this is also important for us so we can understand our own tradition in a better way. In this post I will present a new workbench made after a instruction on an American blog. We where, and still are, mainly interested in workbenches and «snikkarhandverk» as we find it in Norway and Sweden. We are still going to write mainly in Norwegian and Swedish but you are more than welcome to comment and ask questions in English. Anton Nilsson (you can contact him on FB by clicking his name) is a student at Gothenburg University in Sweden. 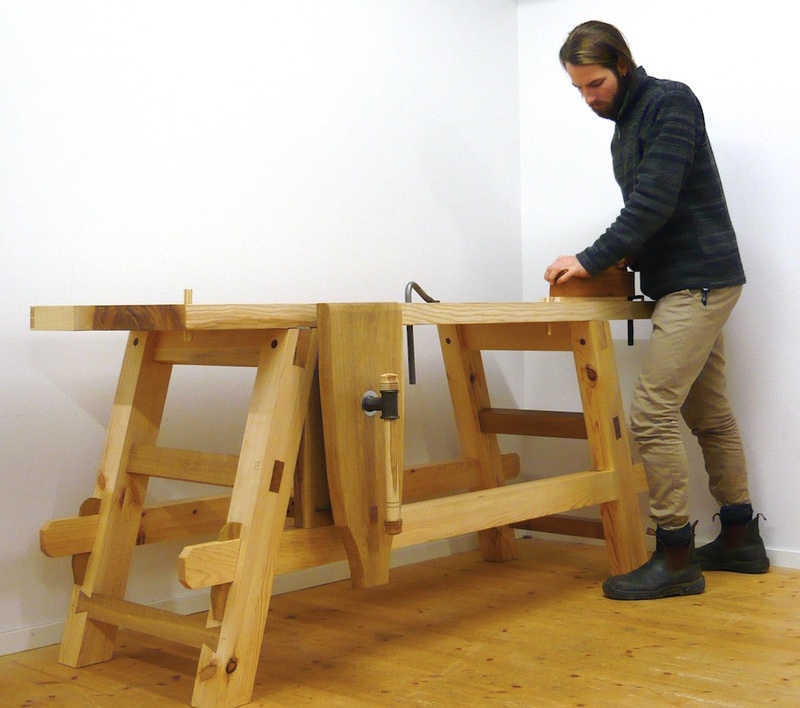 He is following a programme called Building crafts «Bygghantverk» in Mariestad and Tomas Karlsson has been his teacher in joinery, «Snickeri». Anton wanted to build a workbench as his personal study in joinery. He wanted a workbench that where portable and easy to set up and dismantle. He would also like the bench to be as stable as possible without beeing to heavy. The very interesting workbench from Vasa did not fill any of theese requirements and was therefore not an option. Instead he found a description of The Moravian Workbench written by Will Myers. Myers found the original bench in Old Salem, a museum in North Carolina in USA. The bench construction seems to be made so that it easily can be dismantled and possible to transport. Vasa is a Swedish warship built 1626-1628. The ship sank after sailing about 1300 meters into her maiden voyage on 10. August 1628. The ship was salvaged in 1961 and its museum are today one of Swedens most popular tourist attractions. 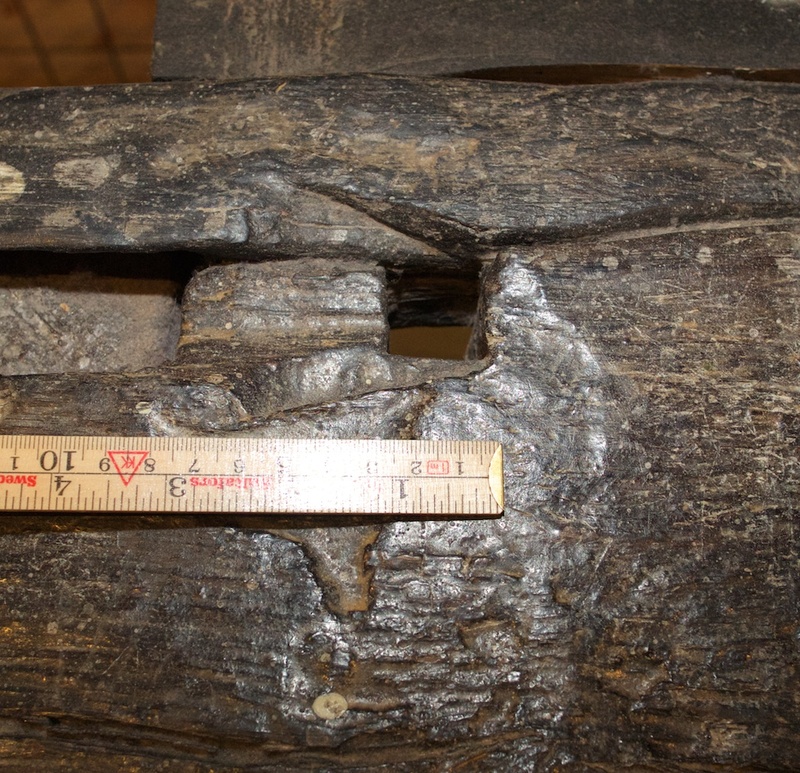 Among the extensive amount of relative well preserved artifacts are a Joiners workbench. Tomas and I have examined the original bench at the Vasa Museum and have had support from Fred Hocker and Evelyn Ansel at the museum. The bench is made of oak and some of the parts have been nailed with iron nails. Theese have corroded away during the 333 years on the seabed. There are traces after a bench hook close to the left front leg. There are also a lot of holes in the bench top and the legs. We have interpreted theese as holes for holdfasts. There are also a sliding deadman with holes of the same dimension. There are some traces after nails that would have fixed a crochet left of the left leg. A crochet have not been found yet. There are some joiners tools from the wreck. Some of the interiour panels of the cabins where still unfinished when the ship sank. We think that the workbench is a Joiners bench and have been used by one or more Joiners making panels and doors for the ship. The bench are 3,3 meters long, 72,3 centimeters (28½») high and the benchtop 35,8 centimeters (14″) wide. We have made ours about 75 centimeters high after we have discussed how erosion might have made the original bench a bit lower. 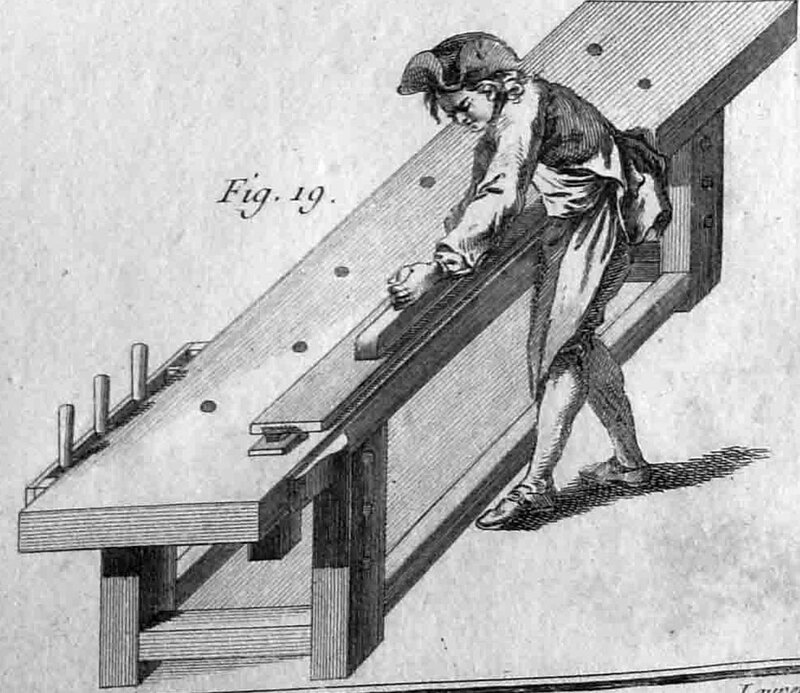 The average body length of the Joiners in 1628 would also have been slightly less than today. I have made a picture gallery of the last part of the work on our bench. Tomas has also made a similar bench that he has posted about. Click on the miniature pictures to display text and higher resolutions. The workbench are going to be on display on «Bygningsvernkongressen» in Oslo in the beginning of September. Later we will use the bench and our workshop in Mariestad to do projects on historical joinery. I have some photos of details of the bench and I have made a small gallery of this. We have done extensive research about this workbench and have posted our work on the blog. We have made categories about this: https://hyvelbenk.wordpress.com/category/snikring-av-hovelbenk/tomas-og-roald-snikrar-hovelbenk-i-mariestad/ and: https://hyvelbenk.wordpress.com/category/snikring-av-hovelbenk/tomas-snikrar-hovelbenk-modell-vasaskipet/ Most of the posts are written in Norwegian or Swedish, but a few posts are written in English. If you have any questions about the workbench from Vasa you are free to comment in English. We will try to ansver. The workbench from the Swedish warship Vasa are from a time where we dont have much information about other workbenches in Sweden and Norway. Few, if any, other workbenches are preserved from that time. The «Vasa workbench» are different than the more recent workbenches from Scandinavia. How does it «relate» to workbenches from other countries? 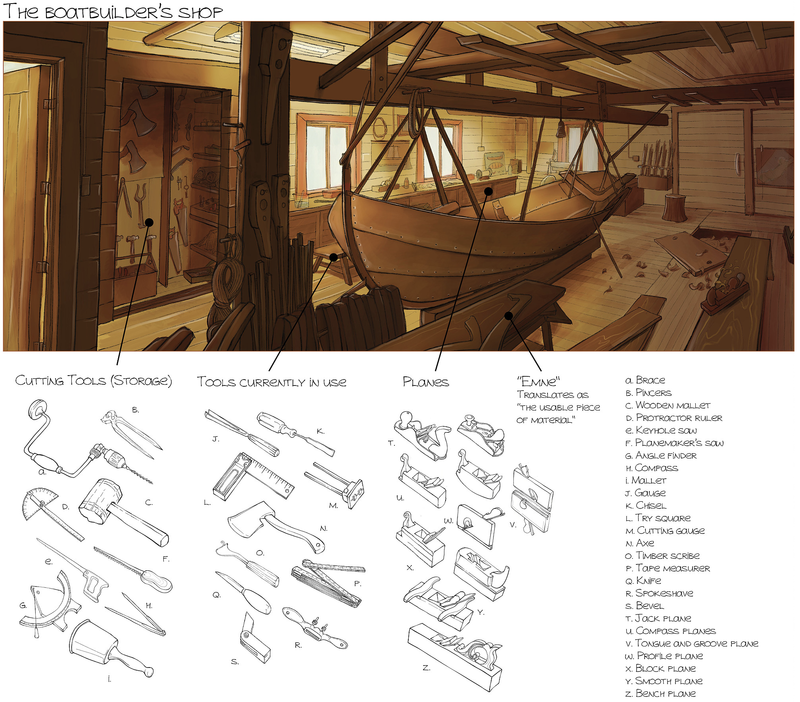 There are many similarities between the workbench from Vasa and the well known French Roubo workbench. There was a lot of Dutch craftsmen working on the building of Vasa and some of the tools found in the wreck seems to be of Dutch orgin. Workbenches, the upper consists of a plank, or an Oak deal, 3 to 4 inches thick, 14 to 16 inches wide and 11 to 20 feet long. Two under-rails hold the legs together and normaly one of them has two freely sliding posts that can be set closer or wider apart. Many similarities to the bench from Vasa. The lower bench is called a Joiners-bench. It consists of a continous beam, 4 x 4 inches and 14 to 16 feet long, and four legs set far apart to allow the bench to stand solidly. This Joiners-bench allows the edges of deals and planks to be worked. Similar to a «Skottbenk». From Gerrit van ver Sterre, 2001, «Four centuries of dutch planes and planemakers». Primavera. His source is: G. J. M. Elbers & J. Polling, Werktuigen machines, hulpmaterieel en gereedschappen in het bouwbedrijf, Culemborg/Antwerpenn/ Keulen 1967, 2e druk. Gerrits father used wrought iron bench stops that where forged with squared shanks so that they fitted into suitably placed mortises in the bench top. At the top end they where flattened and folded over almost at right angles and their leading edges were serrated so that they bit into the end grain of the work that was being planed. 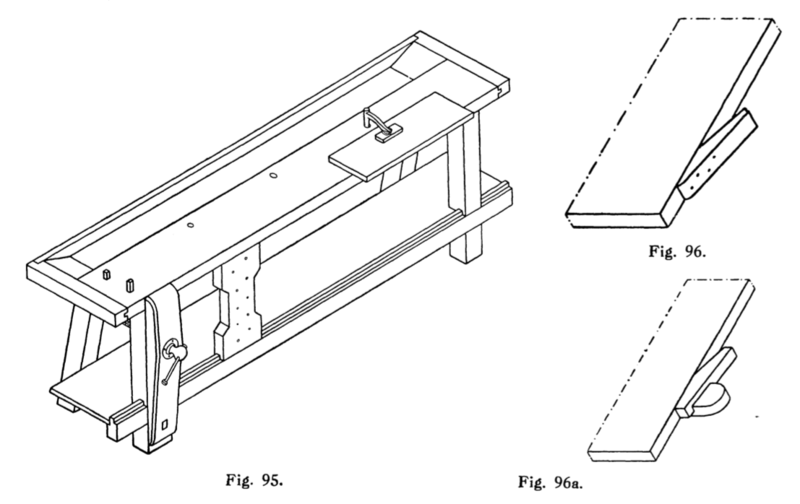 Workbench with a leg vice and a sliding deadman. This is a 20th-century workbench and its accessories. The bench have a lot in common with the Vasa bench and also the bench from Eggagården in Norway. From Gerrit van ver Sterre, 2001, «Four centuries of dutch planes and planemakers». The workbench above have a leg vice and a shelf for tools. Most of the other details are similar to details on the Vasa workbench. 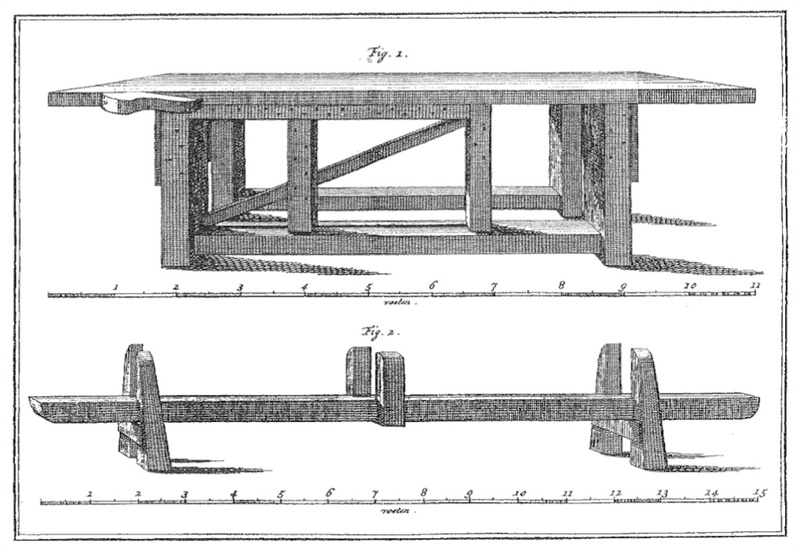 The workbench from Eggagården does have a leg vice but not the sliding deadman. The dimensions described on the first drawing in this post are also similar as the Vasa workbench and the bench from Helberg in Bardu. 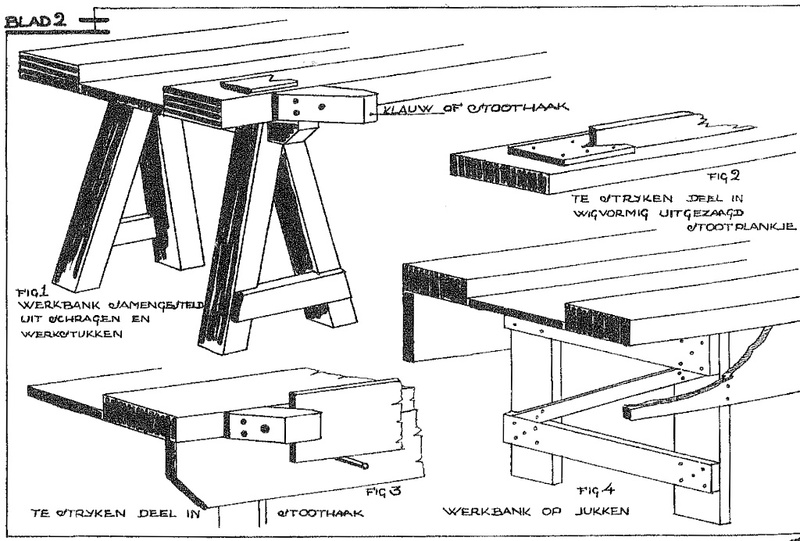 The drawing below are showing other 20th-century Dutch workbenches. 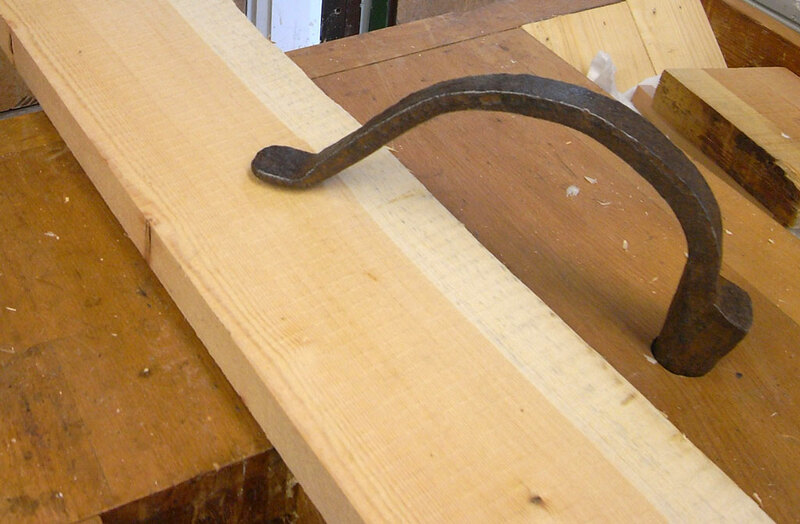 The shaped wooden hook are known as «stoothaak» in Dutch. The benches seems to be made from two beams put on top of trestles. 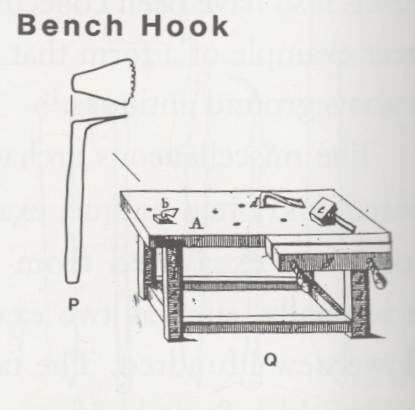 Its functions should be similar as on the bench from Helberg. A 20th-century workbenches and accessories. From Gerrit van ver Sterre, 2001, «Four centuries of dutch planes and planemakers». Een schaafbank in museum De Timmerwerf, De Lier. A planing bench in museum De Timmerwerf, De Lier. From Gerrit van ver Sterre, 2001, «Four centuries of dutch planes and planemakers». As a Norwegian it is very interesting to read about Dutch workbenches. There are many similarities to the older, and less known, Norwegian and Swedish benches. Theese benches are some places are still used by boatbuilders, but are not common among carpenters and joiners today. 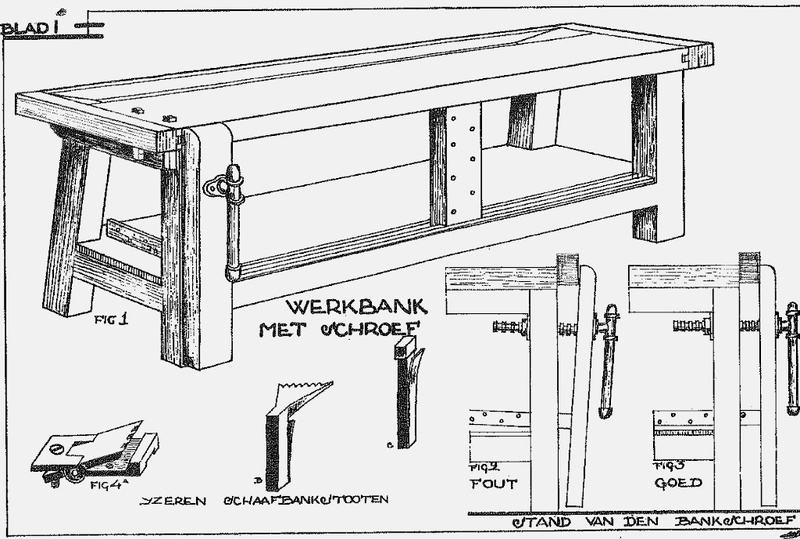 Theese workbenches are called «schaafbank» in Dutch and that is similar to the Norwegian «høvelbenk«, Danish «høvlebænk» and Swedish «hyvelbänk«. All translates to «planing bench». There might be other books about Dutch workbenches that could be interesting to read? Our Dutch readers might fill in about this matter? Tomas has posted about holdfast in Sweden where he present old original holdfasts from the southern part of Sweden, Skåne or Blekinge. There are two different patterns of holdfast and the one that seems to be the oldest are on the picture above. The blacksmith Mattias Helje in Lima in Sweden have tried to analyze how it could have been made. 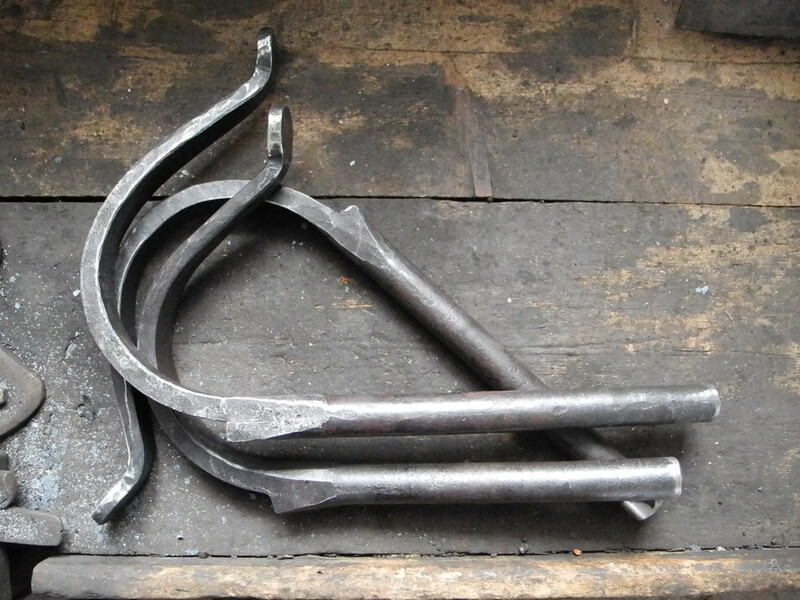 There are at least three different ways to forge a holdfast. 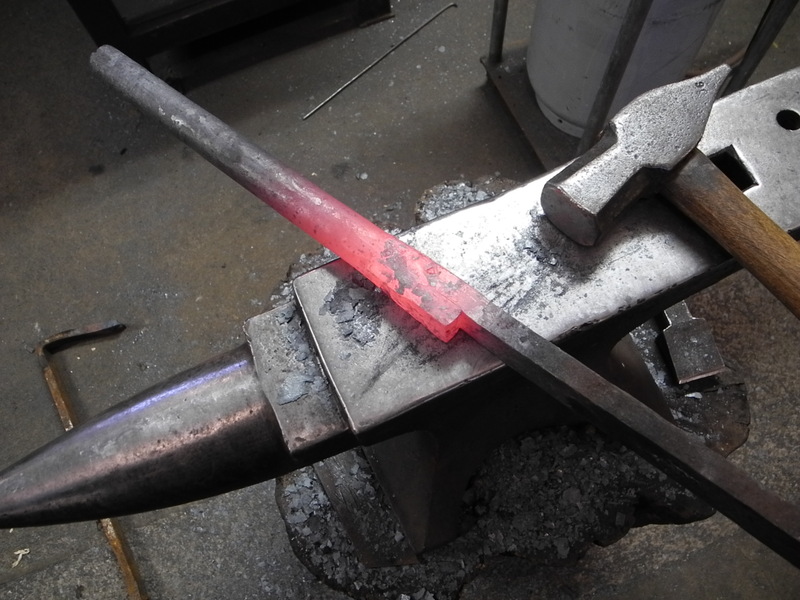 One is to forge it from a single piece of iron with a dimension thick enough to forge the stem and then stretch out the arm. 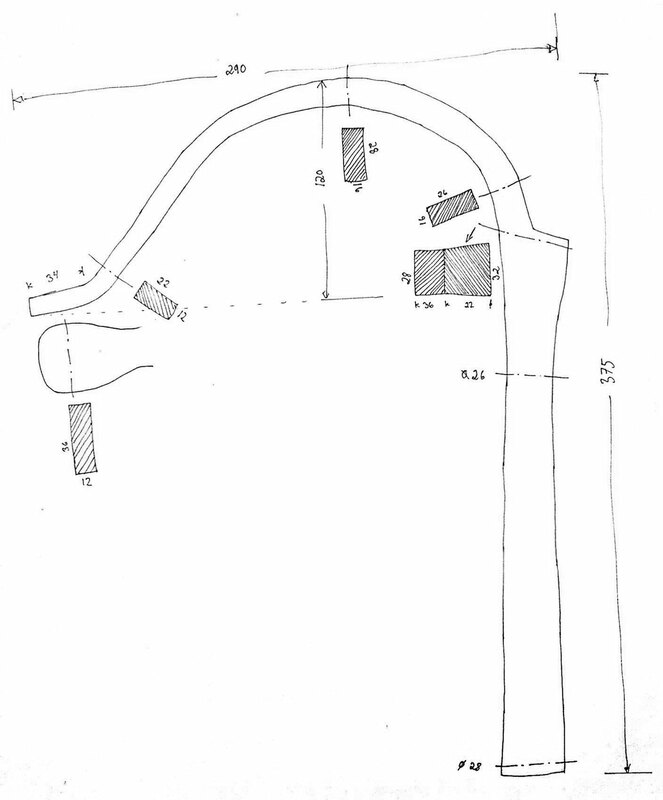 This is the method used by Øystein Myhre that forged the Norwegian patterns of holdfast. The same method is also demonstrated in a video of Peter Ross and Roy Underhill. 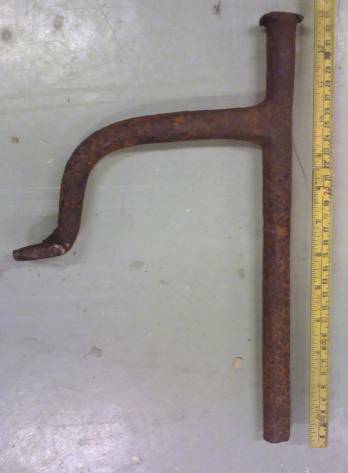 One other method is to use a similar dimension of iron and forge it from two pieces, one for the stem and one for the arm and forge weld the two pieces together like the one below from Nordmøre in Norway. 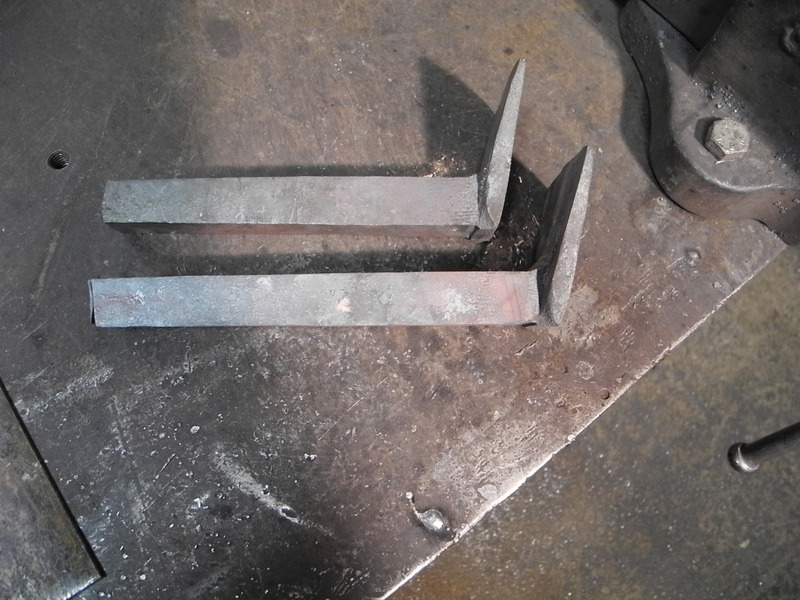 There is also a third way to forge a holdfast. 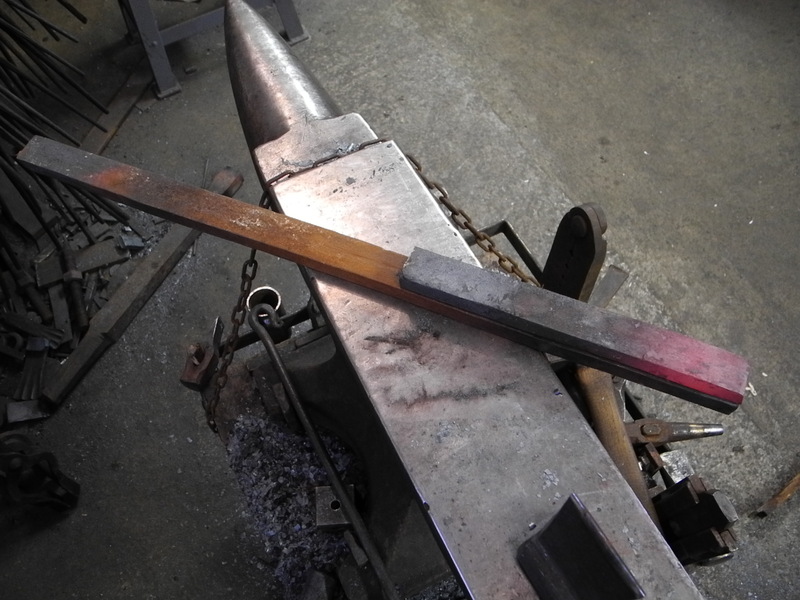 You could start with a dimension that is more like the thickness of the arm and then make the stem by forge welding a piece on to it. 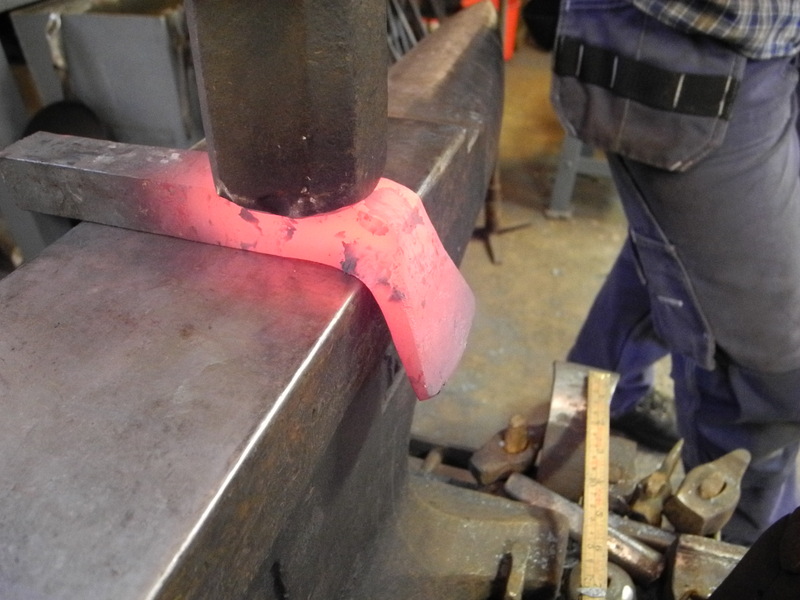 Bukkefot – rams foot, this word is from Øystein Myhre that uses the holdfast in his work as a Norwegian blacksmith. In Swedish there are the names «bänkhållare» (bench holder) and «knekt» (could translate to bracket or something?) in the book “Träslöjd”, Hallén & Nordendal (1923). In inventories in workshops in Stockholm in the early 1700`s there is several mentions of “stämhake”. That could be the same as holdfast. It could translate to “stem hook». Tomas has also learnt the word “fans tumme”, that means “devils thumb”. That is a parallell to the Norwegian joiners “killingfot” (goat kid foot) and blacksmiths “bukkefot” (rams foot). Both refer to a goat foot and the goat and the devil are considered as related in folklore. The devil is usually equipped with rams horn.